In case I ever forget why I plant crocus bulbs in my yard, days like today come along and remind me. Last night we had around 6 inches of sloppy spring snow. Roads were awful, and cars needed scraping before one could drive. It was a cold slap in the face of spring. And then this morning after the snow tapered off, the sun came out and the temperature climbed back into the mid-30's (F). 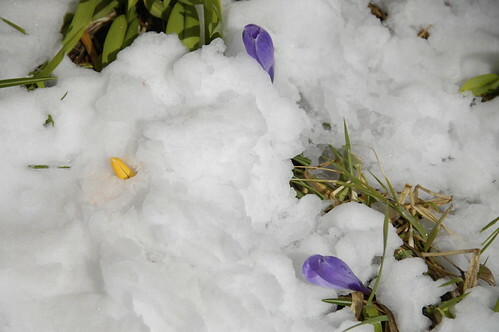 By mid-afternoon, there were the crocuses, shoving their blooms back through the snow.